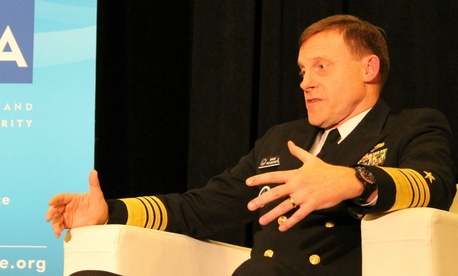 Come January, employees of the National Security Agency will see the fruits of a 10-month “director’s charge” review of the top-secret organization’s structure, its leader, Adm. Mike Rogers, said on Tuesday night. The modernization effort titled “NSA21,” the first since the late 1990s, will address workforce development; collaboration and integration; innovation; and structure of the organization. “It’s all about the data and the people,” said Rogers, speaking to an audience of contractors and current and former agency staffers at a banquet of the nonprofit Intelligence and National Security Alliance. One goal is to break down “cylinders” to improve collaboration and use information technology to enhance the mission, he said. “I’m a big believer” in partnership with the private sector and academia. As NSA director and head of U.S. Cyber Command, Rogers acknowledged that his agency three weeks ago began a new “legal regime” governing its controversial domestic electronic surveillance program, as Section 215 of the USA Patriot Act expired and was replaced by the USA Freedom Act. With a budget below the president’s request, Rogers said, “I have found myself focused on how to optimize resources, to find more money to reflect the environment of today and tomorrow, not the past. It forces us to come up with formal methods to assess the trade-offs to gain by investing somewhere else.” The recent Iran nuclear deal, Rogers noted, will test NSA’s ability to monitor Tehran’s compliance.